One of the most common ways that families preserve the memory of relatives who have passed is by passing down and using objects owned by the family member. These objects may include clothing, jewelry, and various keepsakes, and in some cases, furniture. When items are passed down to the younger generation of a family, these members may find themselves with interesting antique items that have real monetary value, as well as the sentimental value that comes with family heirlooms. There are also some cases in which a family heirloom, such as a piece of furniture that has spent years in an attic, needs to be restored to bring back its original look and function. 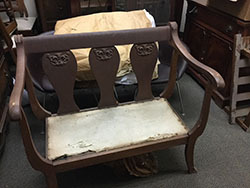 At Furniture Medic by MasterCare Experts, we recently had a customer bring us an old wooden settee that belonged to her grandmother. The settee must have been sitting somewhere unused for a significant period of time because it came to us discolored and worn out. 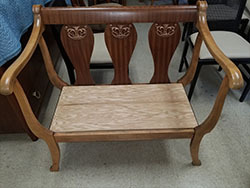 The customer wanted the settee restored to its original, natural wood appearance to honor the memory of her grandmother and have a nice piece of furniture that she could pass down to the younger generations of her family. Because the customer wanted to restore the natural wood color of the settee, no stains could be used in the furniture refinishing process. We accepted the project knowing that our expert craftsmen have the skill and expertise to refinish the settee and restore the original appearance of the wood. The settee was badly discolored when it was brought in. It appeared to be covered with years of dirt buildup that was so dark that the wood grain was no longer visible. The piece of fabric over the seat that is meant to hold a cushion was also damaged and coming apart from the wood. The wood needed to be cleaned up and refinished and the seat needed to be repaired so that it can be sat on without causing additional damage. We pride ourselves on restoring old, worn out wooden furniture to its original appearance with or without the use of stains. In this case, we put the settee through a deluxing process to remove the dirt buildup and any minor damage such as scratches from the surface of the wood. This helped bring out the original luster of the piece and made the wood grain visible again. We then applied a water-based factory finish to preserve and protect the appearance of the natural wood. 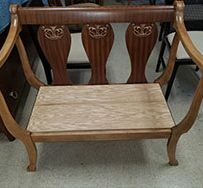 We did not apply any sort of stain because the customer requested that the settee be restored to its original wood appearance. The worn out fabric at the seat of the settee was replaced with wood to provide better support so it can be used again. If you compare the before and after pictures of the settee, you can see how discolored the settee had become and how different it looks after a refinishing process that did not involve colors or stains. Our furniture refinishing services brought out details that had been lost to time, including the lines of the wood grain, the difference in wood color between the arms and the back, and the details of the carvings that are on each splat. This settee is now ready to use and its natural beauty will make a great addition to any home. It is common for people to think that they need to replace wooden furniture once it becomes worn out or extremely dirty. Furniture refinishing and repair services from Furniture Medic by MasterCare Experts are a great alternative to replacing wood furniture. Our craftsmen can restore wooden furniture to its original luster and appearance and make any necessary repairs to ensure that it functions properly. We also provide color matching services and we have many different finish colors and wood stains available to match the original color of the piece or change the color to give it a new appearance. In the case of this settee, we were able to give the piece new life by restoring its original appearance so that it can be used and enjoyed by the next generations within the family. Precision repair: We will repair minor surface damage including scratches, gouges, dents, watermarks, burns, stains, and other blemishes. The settee had a few nicks in the surface but was mostly affected by discoloration. Re-Gluing/ Minor Adjustments: We can repair broken parts and make adjustments to ensure that the piece if functional. With the settee, we had to replace the seat of the piece so it could be used again. Finishing: We refinish wood furniture with a deluxing process that eliminates surface damage and brings back the original luster and appearance of the furniture. Restoration/ Finishing: Our water-based factory finishes restore the appearance of discolored and worn out furniture. We also provide color matching if requested at this stage. At Furniture Medic by MasterCare Experts, we are happy to restore family heirlooms so that they can be used by the younger generations. Family heirlooms like this settee are a part of a family’s history and a great way to carry on the memory of a family member who has passed. 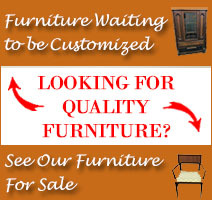 If you have an old piece of wooden furniture that you want to have restored either for monetary or sentimental value, contact our professionals to restore it with our wood furniture refinishing services. Our craftsmen can restore damaged and worn out wooden furniture to return it to its original appearance and functionality. 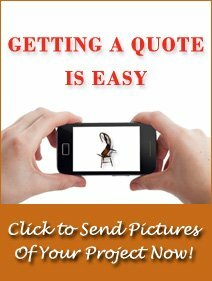 You can reach Furniture Medic by MasterCare Experts by calling (630) 653-3131. You can also submit your project directly to us through our website.